Doomsday Clock moves closer to midnight, but can we really predict the end of the world? The second hand of the Doomsday Clock is now only three minutes to midnight. This is the closest to apocalypse we have come since 1984 – the coldest of Cold War years, just a year after Able Archer, the Petrov incident and Reagan’s “evil empire” speech. 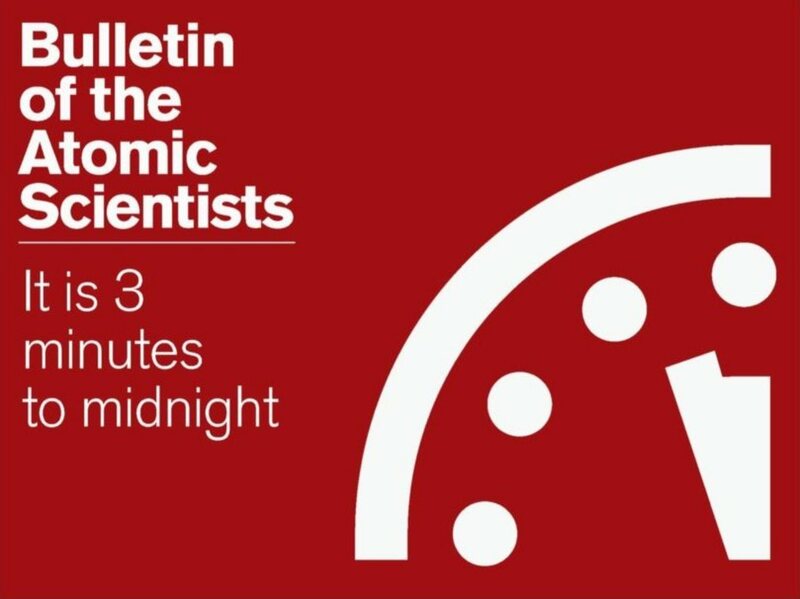 The Bulletin of Atomic Scientists, which controls the clock, said the time was changed on January 22 because of the threat posed by both climate change and nuclear weapons. Increased international tensions, a faltering of the disarmament process, upgrades to nuclear arsenals and increasing proliferation, as well as a lack of progress on curbing emissions make the probability of global catastrophe “very high”. The panel members’ response was to point out that they are “not in the business of forecasting” so much as warning the world of its plight. In this case the clock can be viewed as a form of probabilistic rhetoric. How many times do you need to roll a dice and not get a six until you start suspecting it is loaded? How many times do you need to roll a loaded dice before you have a sense of how loaded it is? Just because something does not happen, doesn’t mean it’s not informative. The new clock is red. In case it wasn’t clear enough already. If we assume there is an unknown probability of nuclear war per year, and every year fate rolls the dice, we can calculate the chance of a given number of years with no nuclear war. We can turn this around to update our estimate of how likely nuclear war is. Back in 1945 we might have been open for almost any risk, but in 2015 the chance of a nuclear war is at least not high. However, we know far more about the world than that. We can investigate the number of close calls that have happened – such as the Cuban Missile crisis and the Norwegian rocket incident – in an attempt to get better estimates. We can analyse the weaknesses of command and control systems, or the risk of accidental faults triggering conflict. But even the best analysis of this kind will be limited. The risks are clearly changing over time, and there may be fundamental things we do not know about the world. How would we actually measure how close we are to the end of the world? One might imagine having actual data: maybe a wormhole leading to a future date and allowing direct observation of when humanity expires. But if the universe is consistent – which is to say paradoxes cannot occur – knowing this information will not allow us to change the date. The value of any information about the risks we face lies in how they allow us to reduce the risk. We almost have a literal clock for certain risks. We roughly know the time when the sun will start expanding and make Earth inhospitable. We could set up a timer counting down to impact if we detected an asteroid or comet on its way towards Earth. However, the evolution of the sun is slow and we have good reason to believe the risk of an asteroid impact in the near future is very low: the utility of such clocks is limited. In the case of earthquakes, supervolcanos or pandemics, the causes start out on a microscopic scale – a stressed mineral grain breaking in a faultline, a mutation in a cell somewhere – and expand exponentially to produce a large event. Here we are dealing with something that is, for all practical purposes, random. These threats must be treated as probabilities: any “clock” would give us a probability estimate. But the actual large threats likely to destroy us are dominated by human factors. This implies far tougher kinds of uncertainty. They change over time, they are affected by self-fulfilling or self-defeating prophecies (like the Doomsday Clock itself), and the very system of risk changes as technology and society changes. Here the normal forms of probability estimate are not just inadequate, they are actively misleading. The 1.4% probability per year of nuclear war sounds very exact, yet the estimate is based on a list of potentially suspect assumptions. The chance of at least one of them being wrong is high. It may be better to explicitly acknowledge the uncertainty, compare what we know to an acceptable risk of Armageddon, and state the nuclear risk as being “unacceptably high”. Model uncertainty is always present, but becomes particularly important when dealing with complex systems where we do not know everything going on. Environmental researchers are looking for ecological or climatological tipping points: if we knew the exact boundary we could make an index (a “Doomsday Yardstick”?) telling us how close we are. But the actual approach is more of a considered expert judgement, and more like the hints in the warmer-colder game rather than an actual distance. Again, the benefit lies in trying to move in the right direction rather than measuring something exactly. 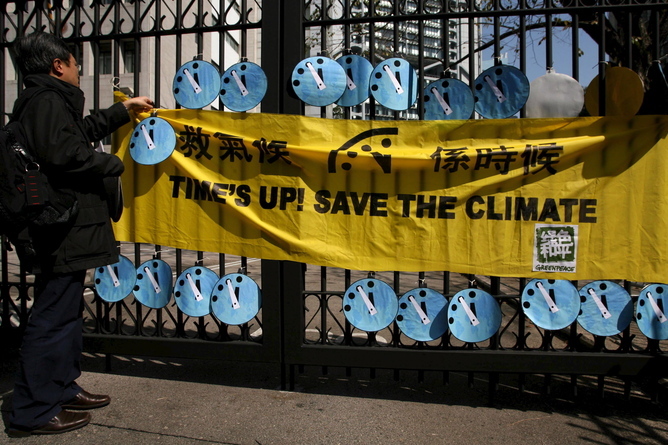 The Doomsday Clock is not a measurement of time, probability or distance. It is a measure of the “strong feeling of urgency” the people who run it have when watching the world-system. It can be compared to the World Economic Forum global risk report that was recently released. This was not a report of the actual risk, but how concerned people are about the risks – the experts might vastly overestimate or underestimate the chance of something happening, and there could be far worse threats out there. Yet it is helpful to compile what concerns people and use it as a start for discussing what we need and are willing to do. Doomsday predictions are rarely informative, but good ones can be directive: they urge us to fix the world.